Manufacturer & Exporter of Storage Pressure Vessels for Air & gases like Nitrogen, Hydrogen & other Gases as desired from pressure range up to 60 Kg/cm2 and volume up to 60 M3 geometrical volume. 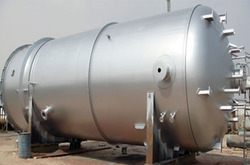 We can make pressure vessels Or storage vessels for almost all the gases as per customer’s needs. We are the leading manufacturer and supplier in offering a huge quality range of Storage Pressure Vessels to our valuable clients. Our products are highly appreciated for there performance and productivity. We can designs & supply almost all type of stationary storage/pressure vessels, vertical or horizontal for compressed Air and gases like Nitrogen, Oxygen, Hydrogen and Ammonia etc. The vessels can be supplied with 3rd party inspection & as per CCOE approvals for manufacturing.